US, 1942, 96 minutes, Black and white. Humphrey Bogart, Mary Astor, Sydney Greenstreet. 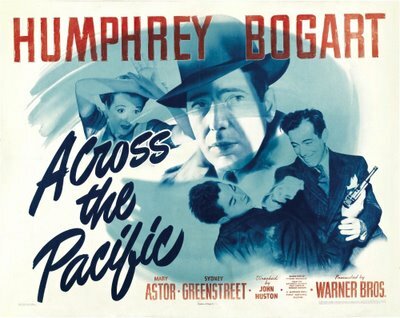 Across the Pacific is an enjoyable, if dated, Humphrey Bogart vehicle. It was screenwriter John Huston's second directing effort (after The Maltese Falcon with Bogart). They were to work effectively together in Key Largo and The Treasure of the Sierra Madre. The film is a contrived propaganda piece, with Bogart as hero, Mary Astor once again as enigmatic heroine, Sydney Greenstreet as a fascist villain. There are American sequences, shipboard sequences, action in Central America. While the characters are generally stereotyped, the stars give then vigour and do their effort for war propaganda. During the filming, John Huston was called up for military service and direction was completed by Vincent Donahue. 1. An entertaining melodrama, Warner Bros style? A star vehicle for Humphrey Bogart? A follow-up to John Huston's The Maltese Falcon? 2. Warner Bros, black and white photography, atmosphere of the studios, for American cities, shipboard, Central America? Musical score? 3. The title, has it any meaning for the film? Its focus on California? The role of America in the war, Japanese invasions after Pearl Harbor? Plots in Central America, the Panama Canal? The title for the war effort? 4. Humphrey Bogart's screen presence and persona? His undercover work as an intelligence officer? Contacts in America? The encounter with the heroine? The encounter with the professor and his background? The decision to go to Panama? The experience on shipboard? The encounter with the Fascists? The uncovering of the plot? The action heroics on the plantation? 5. Mary Astor doing a variation on her enigmatic heroine? Presence in America, relationship with her father, the trip to Panama, the contacts with the fascists? Audience suspicions? Potential romance with Humphrey Bogart? Revelation of the truth? The action sequences? 6. The background of action and American suspicions? Sidney Greenstreet emerging a villainous fascist? Sinister manner? Arrogance? 7. The role of American Intelligence during the war? Undercover agents? On both sides? The focus an Central America? The importance of the Panama Canal? The plantation and the battles? 8. An entertaining melodrama? The use of stereotypes for entertaining war propaganda?